Hi, been waiting for some way to play Sundog again. my alltime favorite. Any info would be great.. Don’t underrstand why there are two sundog projects but no game.. we will play!!!! I would definitely buy this game. I mostly use Windows for my laptop and android for my phone. If you were release it on an apple product (iPad) then I would buy an iPad. My cousin and I would play Sundog on the Atari ST back in the late 80’s. I remember there was a bug we exploited where you could buy concentrators cheap and then resell them in another system for a lot more credits. At one point I had 1.5 million credits. Time Bandit was another great game on the ST.
3) While a smaller market, not as much “noise” in the Wii U market (akin to Atari ST). 1) Remake the original game in Java – as this does not need to be ported for different machines. This would be mainly for original fans who would like to play the game again. 2) An updated version which takes the game into a new level (whatever that is LOL) – expanding the original game concept. Why not start with a remaster of the original? A lot of old games are getting a remaster and it has proven successful. The last thing we need, though, is an iOS exclusive. PC or even Android are both larger markets. Java would increase portability but would have performance issues depending on what you want to accomplish with the engine. I did think the idea of utilizing the Wii-U gamepad would be a neat niche, but the market it limited. If you’re serious about resurrecting SunDog (you seem to put feelers out every few years, Bruce) then get a development team together and Kickstart it. If a remaster pays off, then follow up with a sequel. I’m glad I found game author website! I’m thinking about this game sometimes, and now it back when I played another sci-fi game, FTL – I’m sure here some reason for name game like that! I’m sure this game can be still interested if just ported as was on current platform, however it can be remastered or done from scratch again. Nowdays games like this – “simple”, immersive, just good are very popular and Sun Dog can be recreated in many ways. For example Game Maker, have possibility to export games for Windows, iOs, Android and many other systems and development is very fast. As multi-platform version it can be done even in HTML5, however I’m not big fan of this solution, and I decided to work on my own project in Game Maker. O loved this game and I want to play it again. Sorry my English, fingers crossed! I am considering trying to find someone local with an older system I can take off their hands to play games again. Such fond memories of this one! I would love to see Sundog in Android. It was one of my favorite game back in Apple IIe. Seeing the city grew is amazing. 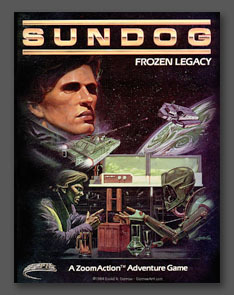 I would love to see a rebuild of sundog, I played through it so many times as a kid on my Apple IIe. I think you are going to miss the window soon… we’re all getting old. I’d buy whatever device I needed to play a new sequel to it if it had the same open concept.